Connecticut Agriculture in the Classroom is pleased to announce its 2010 Connecticut Ag Literacy Event. This event supports its mission of fostering awareness, understanding, and appreciation of agriculture and the food, fiber, flower, forestry and fuel systems. During 2010, volunteers throughout the state will go into classrooms to read a book with an agricultural theme and talk to students about agriculture. 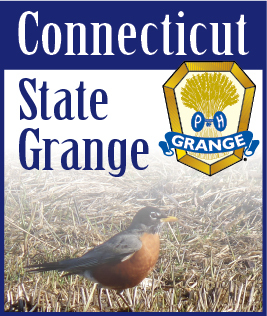 The book will be donated to the school library with a special bookplate recognizing the donors, Connecticut Agricultural Education Foundation, Connecticut Department of Agriculture and the Connecticut Poultry Association as partners in this 2010 Connecticut Ag Literacy Event. As a result of your volunteer effort, you can help us foster agricultural literacy and educate students about the significance of agriculture in the state of Connecticut. We are asking our friends to go into a local elementary school classroom, read the designated book and talk to students about the importance of Connecticut agriculture to their daily lives. All are encouraged to remind children and adults that food production begins on a farm. Chickens are raised for meat, eggs, feathers and show. Some chicken products come to you just the way they grow; others are processed or changed in some way before they arrive at the grocery store. Connecticut has a significant poultry and egg industry. The designated book for 2010 is Chicks & Chickens by Gail Gibbons (Holiday House). Gibbons, a Vermont author and illustrator has more than 100 informational books for children to her credit. Chicks & Chickens is one of 160 "Accurate Ag Books", The American Farm Bureau Foundation for Agriculture has recommended for children and adults. A talented writer who turns fact into entertainment, Gail was awarded the prestigious Washington-Post Children's' Book Guild Award for overall contribution to children's' nonfiction. The book is an introduction to the physical characteristics, behavior, and life style of chickens, as well as a discussion of how chickens are raised on farms. We are targeting first grade through fourth grade classrooms with the book Chicks & Chickens. Ideally, reading will take place at the classroom level so there is an opportunity for students to ask questions and participate in a discussion. Partner organizations have provided materials, funding for books and product donations. A resource packet will be provided to each classroom teacher participating in this event. We encourage each educator to use the materials provided and share the information with other classroom teachers. Also, we have included an educator evaluation form which we would be grateful to receive as it will help us determine how we can continue to improve this valuable program. If you have questions, please direct them to Eleanore Provencal, Connecticut Coordinator for Ag in the Classroom. Eleanore can be contacted at eleanore@ctaef.org.